Gattuso put in yet another strong performance tonight, completely shutting down any hope Martinez had of influencing the game. Aquilani's absence made it easier to concentrate on Juve's wide players and, while Krasic got away a few times, there was little danger. Each time he pierced through the midfield he ran into a defensive wall which was helped by Matri's night off and Toni's knack for dropping back to the half line to receive the ball and then not getting back to his post in time to provide an option for Krasic. For the second derby in a row, Abbiati didn't have to make a single serious save and that says something - it says Milan is ready to march to the title and it looks like only a very unlikely contingent of injuries could stop the rossoneri. With a superb group of strikers, a strong group of defensive midfielders and a very solid defensive line, Milan is still not on par with Europe's best teams but it is without a doubt the best team in Italy this year, and with 2 or 3 proper reinforcements in the summer could go on to dominate the next couple of Serie A seasons. Abate was outstanding again, if we were to nitpick we could find a tiny flaw in his game - when the team were doing their best to keep hold of possession in the dying minutes of the game, he looked nervous on the ball and, instead of passing it around with the midfielders and Nesta, opted to kick it far up field on a few occasions, which resulted in Juventus launching a few (however nonthreatening) attacks in the last 5 minutes. It's a minor point and we'll chalk it down to inexperience, I love Abate more and more with every game and his clearance in the first half when the ball was behind Nesta and Thiago Silva was absolutely sublime. Zlatan looked worn out but still managed to be crucial in tipping the balance in Milan's favor, and as long as he requires the attention of 2-3 defenders at all times it's worth having him on the pitch. He had his pedestrian moments and a part of me wishes he could have been given a rest, but with Pato at home eating chicken soup, that was never an option. Speaking of Pato, I'll assume his flu will be history by Wednesday but I'd still wait until the official statement, and it wouldn't surprise me if Allegri keeps his health status a secret until the day of the game. Del Neri again did nothing to win over the supporters, he used his usual concept and refused to change it even after 70 minutes with almost no positives. I have to admit I am confused by his refusal to change things around when it's not working out, and his substitutes in the 84th minute when he brought on a central back for a left back is the perfect conclusion to yet another disappointing night for him. After thoroughly outplaying Mazzari last week, Allegri pulled off another tactical victory, but this one was almost made all too easy. After a nasty Felipe Melo challenge in the 32nd minute, Kevin Prince Boateng played through the pain for the rest of the first half, and was then taken off for the very mobile Robinho. Hopefully, Prince will only have a minor swelling and in that case should be fit to attempt winning the tough midfield battle against Tottenham in 4 days. That's all for today, Milan fans enjoy your win, and stay tuned in the next couple of days for our take on the Champions League clash that awaits Milan. P.S. I am glad to be on point with my prediction in the three blog preview earlier this week. You see, I saw a late 1-0 win for Milan in a dream. 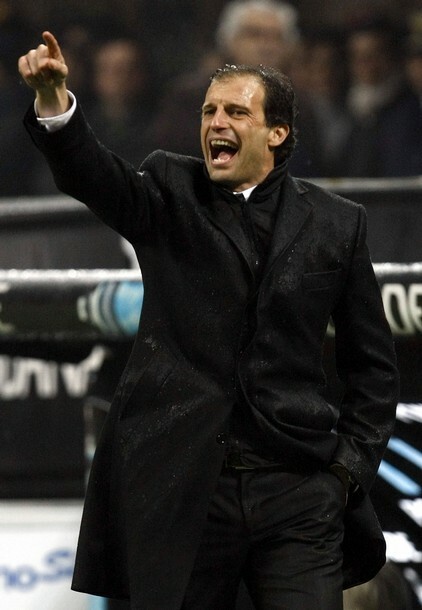 Or I assumed Allegri would use the same tactics he used against Napoli, except Juve would be tougher than Napoli. Not sure which.